For other writings attributed to Enoch, see Book of Enoch (disambiguation). The Book of Enoch (also 1 Enoch; Ge'ez: መጽሐፈ ሄኖክ mätṣḥäfä henok) is an ancient Jewish religious work, ascribed by tradition to Enoch, the great-grandfather of Noah, although modern scholars estimate the older sections (mainly in the Book of the Watchers) to date from about 300 BC, and the latest part (Book of Parables) probably to the first century BC. It is not part of the biblical canon as used by Jews, apart from Beta Israel. Most Christian denominations and traditions may accept the Books of Enoch as having some historical or theological interest, but they generally regard the Books of Enoch as non-canonical or non-inspired. It is regarded as canonical by the Ethiopian Orthodox Tewahedo Church and Eritrean Orthodox Tewahedo Church, but not by any other Christian groups. It is wholly extant only in the Ge'ez language, with Aramaic fragments from the Dead Sea Scrolls and a few Greek and Latin fragments. For this and other reasons, the traditional Ethiopian belief is that the original language of the work was Ge'ez, whereas non-Ethiopian scholars tend to assert that it was first written in either Aramaic or Hebrew; Ephraim Isaac suggests that the Book of Enoch, like the Book of Daniel, was composed partially in Aramaic and partially in Hebrew. :6 No Hebrew version is known to have survived. It is asserted in the book itself that its author was Enoch, before the Biblical Flood. The authors of the New Testament were familiar with the content of the story and influenced by it: a short section of 1 Enoch (1 En 1:9 or 1 En 2:1 depending on the translation) is quoted in the New Testament, Epistle of Jude, Jude 1:14–15, and is attributed there to "Enoch the Seventh from Adam" (1 En 60:8). The text was also utilised by the community that originally collected the Dead Sea Scrolls. And Enoch also, the seventh from Adam, prophesied of these, saying, Behold, the Lord cometh with ten thousands of his saints, To execute judgment upon all, and to convict all that are ungodly among them of all their ungodly deeds which they have ungodly committed, and of all their hard speeches which ungodly sinners have spoken against him. Under the heading of canonicity, it is not enough to merely demonstrate that something is quoted. Instead, it is necessary to demonstrate the nature of the quotation. In the case of the Jude 14 quotation of 1 Enoch 1:9, it would be difficult to argue that Jude does not quote Enoch as an historical prophet since he cites Enoch by name. However, there remains a question as to whether the author of Jude attributed the quotation believing the source to be the historical Enoch before the flood or a midrash of Deut 33:2–3. The Greek text might seem unusual in stating that "Enoch the Seventh from Adam" prophesied "to" (dative case) not "of" (genitive case) the men, however, this might indicate the Greek meaning “against them” – the dative τούτοις as a dativus incommodi (dative of disadvantage). Also, it has been alleged that 1 Peter, (in 1Peter 3:19–20) and 2 Peter (in 2Peter 2:4–5) make reference to some Enochian material. The Book of Enoch was considered as scripture in the Epistle of Barnabas (16:4) and by many of the early Church Fathers, such as Athenagoras, Clement of Alexandria, Irenaeus and Tertullian, who wrote c. 200 that the Book of Enoch had been rejected by the Jews because it contained prophecies pertaining to Christ. However, later Fathers denied the canonicity of the book, and some even considered the Epistle of Jude uncanonical because it refers to an "apocryphal" work. Additionally, there are the manuscripts used by the Ethiopian Orthodox Tewahedo Church for preparation of the deuterocanonicals from Ge'ez into the targumic Amharic in the bilingual Haile Selassie Amharic Bible (Mashaf qeddus bage'ezenna ba'amaregna yatasafe 4 vols. c.1935). Codex Panopolitanus (Cairo Papyrus 10759), named also Codex Gizeh or Akhmim fragments, consists of fragments of two 6th-century papyri containing portions of chapters 1–32 recovered by a French archeological team at Akhmim in Egypt and published five years later, in 1892. The 1976 publication by Milik of the results of the paleographic dating of the Enochic fragments found in Qumran made a breakthrough. According to this scholar, who studied the original scrolls for many years, the oldest fragments of the Book of Watchers are dated to 200–150 BC. Since the Book of Watchers shows evidence of multiple stages of composition, it is probable that this work was extant already in the 3rd century BC. The same can be said about the Astronomical Book. There is little doubt that 1 Enoch was influential in molding New Testament doctrines about the Messiah, the Son of Man, the messianic kingdom, demonology, the resurrection, and eschatology. :10 The limits of the influence of 1 Enoch are discussed at length by R.H. Charles E Isaac, and G.W. Nickelsburg in their respective translations and commentaries. It is possible that the earlier sections of 1 Enoch had direct textual and content influence on many Biblical apocrypha, such as Jubilees, 2 Baruch, 2 Esdras, Apocalypse of Abraham and 2 Enoch, though even in these cases, the connection is typically more branches of a common trunk than direct development. The Greek text was known to, and quoted, both positively and negatively, by many Church Fathers: references can be found in Justin Martyr, Minucius Felix, Irenaeus, Origen, Cyprian, Hippolytus, Commodianus, Lactantius and Cassian. :430 After Cassian and before the modern "rediscovery", some excerpts are given in the Byzantine Empire by the 8th-century monk George Syncellus in his chronography, and in the 9th century, it is listed as an apocryphon of the New Testament by Patriarch Nicephorus. In 2001 George W.E. Nickelsburg published the first volume of a comprehensive commentary on 1 Enoch in the Hermeneia series. Since the year 2000, the Enoch seminar has devoted several meetings to the Enoch literature and has become the center of a lively debate concerning the hypothesis that the Enoch literature attests the presence of an autonomous non-Mosaic tradition of dissent in Second Temple Judaism. This first section of the Book of Enoch describes the fall of the Watchers, the angels who fathered the Nephilim (cf. the bene Elohim, Genesis 6:1–2) and narrates the travels of Enoch in the heavens. This section is said to have been composed in the 4th or 3rd century BC according to Western scholars. 1-5. Parable of Enoch on the Future Lot of the Wicked and the Righteous. 6-11. The Fall of the Angels: the Demoralization of Mankind: the Intercession of the Angels on behalf of Mankind. The Dooms pronounced by God on the Angels of the Messianic Kingdom. 12-16. Dream-Vision of Enoch: his Intercession for Azazel and the fallen angels: and his Announcement of their first and final Doom. 17-36. Enoch's Journeys through the Earth and Sheol: Enoch also traveled through a portal shaped as a triangle to heaven. 20. Names and Functions of the Seven Archangels. 21. Preliminary and final Place of Punishment of the fallen Angels (stars). 22. Sheol or the Underworld. 23. The fire that deals with the Luminaries of Heaven. 24-25. The Seven Mountains in the North-West and the Tree of Life. 26. Jerusalem and the Mountains, Ravines, and Streams. 27. The Purpose of the Accursed Valley. 28-33. Further Journey to the East. 34-35. Enoch's Journey to the North. 36. The Journey to the South. The introduction to the Book of Enoch tells us that Enoch is "a just man, whose eyes were opened by God so that he saw a vision of the Holy One in the heavens, which the sons of God showed to me, and from them I heard everything, and I knew what I saw, but [these things that I saw will] not [come to pass] for this generation, but for a generation that has yet to come." And Semjâzâ, who was their leader, said unto them: "I fear ye will not indeed agree to do this deed, and I alone shall have to pay the penalty of a great sin." And they all answered him and said: "Let us all swear an oath, and all bind ourselves by mutual imprecations not to abandon this plan but to do this thing." Then sware they all together and bound themselves by mutual imprecations upon it. And they were in all two hundred; who descended in the days of Jared on the summit of Mount Hermon, and they called it Mount Hermon, because they had sworn and bound themselves by mutual imprecations upon it. The names of the leaders are given as "Samyaza (Shemyazaz), their leader, Araqiel, Râmêêl, Kokabiel, Tamiel, Ramiel, Dânêl, Chazaqiel, Baraqiel, Asael, Armaros, Batariel, Bezaliel, Ananiel, Zaqiel, Shamsiel, Satariel, Turiel, Yomiel, Sariel." Four fragmentary editions of the Astronomical Book were found at Qumran, 4Q208-211. 4Q208 and 4Q209 have been dated to the beginning of the 2nd century BC, providing a terminus ante quem for the Astronomical Book of the 3rd century BC. The fragments found in Qumran also include material not contained in the later versions of the Book of Enoch. This book contains descriptions of the movement of heavenly bodies and of the firmament, as a knowledge revealed to Enoch in his trips to Heaven guided by Uriel, and it describes a Solar calendar that was later described also in the Book of Jubilees which was used by the Dead Sea sect. The use of this calendar made it impossible to celebrate the festivals simultaneously with the Temple of Jerusalem. It then describes the story of Moses and Aaron (90:13–15), including the miracle of the river splitting in two for them to pass, and the creation of the stone commandments. Eventually they arrived at a "pleasant and glorious land" (90:40) where they were attacked by dogs (Philistines), foxes (Ammonites, Moabites), and wild boars (Esau). It describes the creation of Solomon's temple and also the house which may be the tabernacle: "And that house became great and broad, and it was built for those sheep: (and) a tower lofty and great was built on the house for the Lord of the sheep, and that house was low, but the tower was elevated and lofty, and the Lord of the sheep stood on that tower and they offered a full table before Him". This interpretation is accepted by Dillmann (p. 262), Vernes (p. 89), and Schodde (p. 107). It also describes the escape of Elijah the prophet; in 1 Kings 17:2–24, he is fed by "ravens", so if Kings uses a similar analogy, he may have been fed by the Seleucids. "... saw the Lord of the sheep how He wrought much slaughter amongst them in their herds until those sheep invited that slaughter and betrayed His place." This describes the various tribes of Israel "inviting" in other nations "betraying his place" (i.e., the land promised to their ancestors by God). This part of the book can be taken to be the kingdom splitting into the northern and southern tribes, that is, Israel and Judah, eventually leading to Israel falling to the Assyrians in 721 BC and Judah falling to the Babylonians a little over a century later 587 BC. "And He gave them over into the hands of the lions and tigers, and wolves and hyenas, and into the hand of the foxes, and to all the wild beasts, and those wild beasts began to tear in pieces those sheep"; God abandons Israel for they have abandoned him. There is also mention of 59 of 70 shepherds with their own seasons; there seems to be some debate on the meaning of this section, some suggesting that it is a reference to the 70 appointed times in 25:11, 9:2, and 1:12. Another interpretation is the 70 weeks in Daniel 9:24. However, the general interpretation is that these are simply angels. This section of the book and another section near the end describe the appointment by God of the 70 angels to protect the Israelites from enduring too much harm from the "beasts and birds". The later section (110:14) describes how the 70 angels are judged for causing more harm to Israel than he desired, found guilty, and "cast into an abyss, full of fire and flaming, and full of pillars of fire." "And the lions and tigers eat and devoured the greater part of those sheep, and the wild boars eat along with them; and they burnt that tower and demolished that house"; this represents the sacking of Solomon's temple and the tabernacle in Jerusalem by the Babylonians as they take Judah in 587–586 BC, exiling the remaining Jews. "And forthwith I saw how the shepherds pastured for twelve hours, and behold three of those sheep turned back and came and entered and began to build up all that had fallen down of that house". "Cyrus allowed Sheshbazzar, a prince from the tribe of Judah, to bring the Jews from Babylon back to Jerusalem. Jews were allowed to return with the Temple vessels that the Babylonians had taken. Construction of the Second Temple began"; this represents the history of ancient Israel and Judah; the temple was completed in 515 BC. The first part of the next section of the book seems, according to Western scholars, to clearly describe the Maccabean revolt of 167 BC against the Seleucids. The following two quotes have been altered from their original form to make the hypothetical meanings of the animal names clear. According to this theory, the first sentence most likely refers to the death of High Priest Onias III, whose murder is described in 1 Maccabees 3:33–35 (died c. 171 BC). The "great horn" clearly is not Mattathias, the initiator of the rebellion, as he dies a natural death, described in 1 Maccabees 2:49. It is also not Alexander the Great, as the great horn is interpreted as a warrior who has fought the Macedonians, Seleucids, and Ptolemies. Judas Maccabeus (167 BC–160 BC) fought all three of these, with a large number of victories against the Seleucids over a great period of time; "they had no power over it". He is also described as "one great horn among six others on the head of a lamb", possibly referring to Maccabeus's five brothers and Mattathias. If taken in context of the history from Maccabeus's time, Dillman Chrest Aethiop says the explanation of Verse 13 can be found in 1 Maccabees iii 7; vi. 52; v.; 2 Maccabees vi. 8 sqq., 13, 14; 1 Maccabees vii 41, 42; and 2 Maccabees x v, 8 sqq. Maccabeus was eventually killed by the Seleucids at the Battle of Elasa, where he faced "twenty thousand foot soldiers and two thousand cavalry". At one time, it was believed this passage might refer to John Hyrcanus; the only reason for this was that the time between Alexander the Great and John Maccabeus was too short. However, it has been asserted that evidence shows that this section does indeed discuss Maccabeus. It then describes: "And I saw till a great sword was given to the sheep, and the sheep proceeded against all the beasts of the field to slay them, and all the beasts and the birds of the heaven fled before their face." This might be simply the "power of God": God was with them to avenge the death. It may also be Jonathan Apphus taking over command of the rebels to battle on after the death of Judas. John Hyrcanus (Hyrcanus I, Hasmonean dynasty) may also make an appearance; the passage "And all that had been destroyed and dispersed, and all the beasts of the field, and all the birds of the heaven, assembled in that house, and the Lord of the sheep rejoiced with great joy because they were all good and had returned to His house" may describe John's reign as a time of great peace and prosperity. Certain scholars also claim Alexander Jannaeus of Judaea is alluded to in this book. And I saw that a white bull was born, with large horns and all the beasts of the field and all the birds of the air feared him and made petition to him all the time. And I saw till all their generations were transformed, and they all became white bulls; and the first among them became a lamb, and that lamb became a great animal and had great black horns on its head; and the Lord of the sheep rejoiced over it and over all the oxen. Still another interpretation, which has just as much as credibility, is that the last chapters of this section simply refer to the infamous battle of Armageddon, where all of the nations of the world march against Israel; this interpretation is supported by the War Scroll, which describes what this epic battle may be like, according to the group(s) that existed at Qumran. Apocalypse of Weeks (93:1–10, 91:11–17): this subsection, usually dated to the first half of the 2nd century BC, narrates the history of the world using a structure of ten periods (said "weeks"), of which seven regard the past and three regard future events (the final judgment). The climax is in the seventh part of the tenth week where "new heaven shall appear" and "there will be many weeks without number for ever, and all shall be in goodness and righteousness". Exhortation (91:1–10, 91:18–19): this short list of exhortations to follow righteousness, said by Enoch to his son Methuselah, looks to be a bridge to next subsection. Epistle (92:1–5, 93:11–105:2): the first part of the epistle describes the wisdom of the Lord, the final reward of the just and the punishment of the evil, and the two separate paths of righteousness and unrighteousness. Then there are six oracles against the sinners, the witness of the whole creation against them, and the assurance of the fate after death. 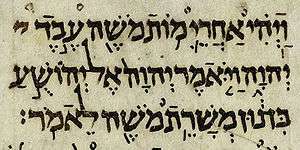 According to Boccaccini:131–138 the epistle is composed of two layers: a "proto-epistle", with a theology near the deterministic doctrine of the Qumran group, and a slightly later part (94:4–104:6) that points out the personal responsibility of the individual, often describing the sinners as the wealthy and the just as the oppressed (a theme found also in the Book of Parables). Birth of Noah (106–107): this part appears in Qumran fragments separated from the previous text by a blank line, thus appearing to be an appendix. It tells of the deluge and of Noah, who is born already with the appearance of an angel. This text probably derives, as do other small portions of 1 Enoch, from an originally separate book (see Book of Noah), but was arranged by the redactor as direct speech of Enoch himself. Conclusion (108): this second appendix was not found in Qumran and is considered to be the work of the final redactor. It highlights the "generation of light" in opposition to the sinners destined to the darkness. The suffix of the names 'el' means 'God' (List of names referring to El) which is used in the names of high-ranking angels. The Archangels all include this such as Uriel (Flame of God) or Michael "who is like God?". Another is given as Gadreel, who is said to have tempted Eve; Schmidt lists the name as meaning "the helper of God." ↑ There are two other books named "Enoch": 2 Enoch, surviving only in Old Slavonic (Eng. trans. by R. H. Charles 1896) and 3 Enoch (surviving in Hebrew, c. fifth to sixth century A.D.). ↑ The Book of Enoch - The Reluctant Messenger. Retrieved 14 June 2014. ↑ Cheyne and Black Encyclopedia Biblica (1899), "Apocalyptic Literature" (column 220) s:Encyclopaedia Biblica/Apocalyptic Literature#II. The Book of Enoch. "The Book of Enoch as translated into Ethiopic belongs to the last two centuries B.C. 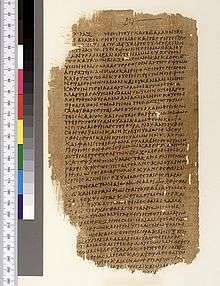 All the writers of the NT were familiar with it and were more or less influenced by it in thought"
1 2 Clontz, TE; Clontz, J (2008), The Comprehensive New Testament with complete textual variant mapping and references for the Dead Sea Scrolls, Philo, Josephus, Nag Hammadi Library, Pseudepigrapha, Apocrypha, Plato, Egyptian Book of the Dead, Talmud, Old Testament, Patristic Writings, Dhammapada, Tacitus, Epic of Gilgamesh, Cornerstone, p. 711, ISBN 978-0-9778737-1-5 . ↑ "The introduction… picks up various biblical passages and re-interprets them, applying them to Enoch. Two passages are central to it The first is Deuteronomy 33:1 … the second is Numbers 24:3–4 Michael E. Stone Selected studies in pseudepigrapha and apocrypha with special reference to the Armenian Tradition (Studia in Veteris Testamenti Pseudepigrapha No 9) p. 422. ↑ Barton, John (2007), The Old Testament: Canon, Literature and Theology Society for Old Testament Study . ↑ E. M. Sidebottom, james, Jude and 2 Peter (London: Nelson, 1967), p. 90: '14. of these: lit., 'to these'; Jude has some odd use of the dative'. Also see Wallace D. Greek Grammar beyond the Basics. The unique use of the dative toutois in the Greek text (προεφήτευσεν δὲ καὶ τούτοις) is a departure from normal NT use where the prophet prophesies "to" the audience "concerning" (genitive peri auton) false teachers etc. ↑ Williams, Martin (2011). The doctrine of salvation in the first letter of Peter. Cambridge University Press. p. 202. ISBN 9781107003286. ↑ Pearl of Great Price Student Manual. LDS Church. 2000. pp. 3–27. ↑ Nibley, Hugh (October 1975). "A Strange Thing in the Land: The Return of the Book of Enoch, Part 1". Ensign. ↑ The History of The Church of Jesus Christ of Latter-day Saints. pp. 132–33. ↑ Gabriele Boccaccini Enoch and the Messiah Son of Man: revisiting the Book of parables 2007 p367 "..Ethiopian scholars who produced the targumic Amharic version of 1 Enoch printed in the great bilingual Bible of Emperor Haile Selassi"
↑ P. Flint The Greek fragments of Enoch from Qumran cave 7 in ed.Boccaccini Enoch and Qumran Origins 2005 ISBN 0-8028-2878-7, pp. 224–233. ↑ M.R. James, Apocrypha Anecdota T&S 2.3 Cambridge 1893 pp. 146–150. ↑ "[I]t is questionless that the use of letters was found out in the very infancy of the world, proved by those prophecies written on pillars of stone and brick by Enoch, of which Josephus affirmeth that one of them remained even in his time ... But of these prophecies of Enoch, Saint Jude testifieth; and some part of his books (which contained the course of the stars, their names and motions) were afterward found in Arabia fœlix, in the Dominion of the Queene of Saba (saith Origen) of which Tertullian affirmeth that he had seen and read some whole pages." Walter Raleigh, History of the World, chapter 5, section 6. (Google Books) Raleigh's marginal note reads: "Origen Homil. 1 in Num. ", i.e., Origen's Homily 1 on Numbers. ↑ George W. E. Nickelsburg; Jacob Neusner; Alan Alan Jeffery Avery-Peck, eds. (2003). Enoch and the Messiah Son of Man: Revisiting the Book of Parables. BRILL. pp. 71–74. Retrieved 24 February 2014. ↑ Charles, R. H. (2004). The Apocrypha and Pseudepigrapha of the Old Testament, Volume Two: Pseudepigrapha. Apocryphile Press. p. 185. ISBN 978-0-9747623-7-1. ↑ M. A. KNIBB (1979). "The Date of the Parables of Enoch: A Critical Review". Cambridge University Press. pp. 358–359. Retrieved 24 February 2014. 1 2 3 4 5 6 7 Gabriele Boccaccini, ed. (2007). Enoch and the Messiah Son of Man: Revisiting the Book of Parables. Wm. B. Eerdmans Publishing. Retrieved 24 February 2014. 1 2 "SON OF MAN". Jewish Encyclopedia. JewishEncyclopedia.com. Retrieved 24 February 2014. 1 2 Chad T. Pierce (2011). Spirits and the Proclamation of Christ: 1 Peter 3:18-22 in Light of Sin and Punishment Traditions in Early Jewish and Christian Literature. Mohr Siebeck. p. 70. Retrieved 24 February 2014. ↑ Michael Anthony Knibb (2009). Essays on the Book of Enoch and Other Early Jewish Texts and Traditions. BRILL. pp. 139–142. Retrieved 24 February 2014. ↑ James H. Charlesworth (1985). The Old Testament Pseudepigrapha and the New Testament: Prolegomena for the Study of Christian Origins. CUP Archive. p. 89. Retrieved 24 February 2014. 1 2 3 4 Beckwith, Roger T. (1996). Calendar and chronology, Jewish and Christian. Leiden: Brill. ISBN 90-04-10586-7. ↑ Martinez, Florentino Garcia; Tigchelaar, Eibert J.C., eds. (1997). The Dead Sea Scrolls: Study Edition. Brill/Eerdmans. pp. 430–443. ISBN 0-8028-4493-6. 1 2 Nickelsburg, George W. (2005). Jewish Literature between the Bible and the Mishnah, 2 ed. Minneapolis: Fortress Press. p. 44. ISBN 0-8006-3779-8. ↑ Jackson, David R. (2004). Enochic Judaism: three defining paradigm exemplars. Continuum. p. 17. ISBN 978-0-567-08165-0. Josef T. Milik (with Matthew Black). The Books of Enoch: Aramaic Fragments of Qumran Cave 4 (Oxford: Clarendon, 1976). William Morfill. The Book of the Secrets of Enoch (1896), from Mss Russian Codex Chludovianus, Bulgarian Codex Belgradensi, Codex Belgradensis Serbius. Florentino Martinez & Tigchelaar. The Dead Sea Scrolls Study Edition (Brill, 1999) with Aramaic studies from J.T. Milik, Hénoc au pays des aromates. James H. Charlesworth. The Old Testament Pseudepigrapha and the New Testament (CUP Archive: 1985) ISBN 1-56338-257-1 - The Old Testament Pseudepigrapha Vol.1 (1983). Veronika Bachmann. Die Welt im Ausnahmezustand. Eine Untersuchung zu Aussagegehalt und Theologie des Wächterbuches (1 Hen 1–36) (Berlin: de Gruyter 2009) ISBN 978-3-11-022429-0. George H. Schodde 1882 Translation (PDF format). August Dillmann (1893). The Book of Enoch (1Enoch) translated from Geez, መጽሐፈ ፡ ሄኖክ ።. William Morfill (1896). The Book of the Secrets of Enoch (2Enoch) translated from slave languages (Russian and Serbian - Mss. Codex Chludovianus and Codex Belgradensis Serbius). Hugo Odeberg (1928). The Hebrew Book of Henoc (3Enoch), from a Rabbinic perspective and experiment. Rev. D.A. De Sola (1852). Signification of the Proper Names occurring in the Book of Enoch from the Hebrew and Chaldee languages.